A lively atmosphere, great music, and a spectacular view make The Empire Hotel Rooftop Club a great spot for a VIP party. Ask around New York City and you will hear all kinds of positive reviews about this well-known venue. It isn't easy to get in, but those who have been there always have some good stories to tell. 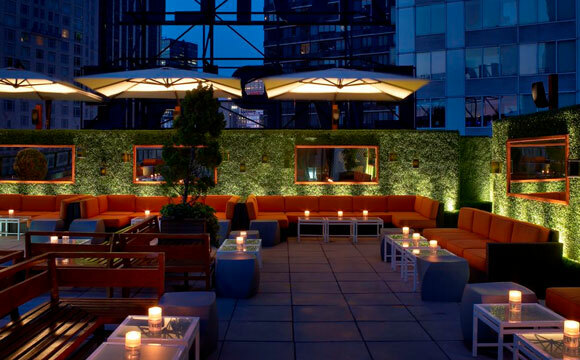 The Empire Hotel Rooftop Club's breathtaking bird's-eye view of the New York streets gives this club a refined personality that is unrivaled by any other venue in the city. Bachelor Party Bay gives you exclusive access to the club for a VIP party in the sky. The club is located just a few blocks from Times Square. 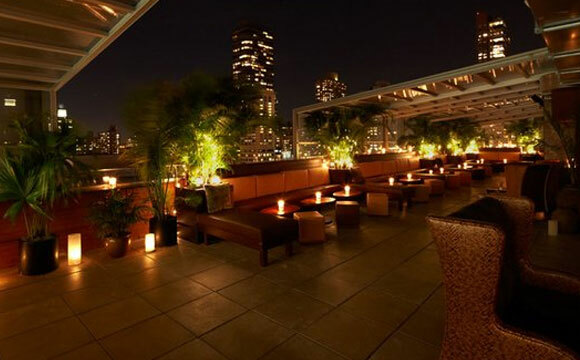 As the name suggests, The Empire Hotel Rooftop Club is located on the rooftop of the Empire Hotel. The line for the club begins at street level where you will meet your host. For regular patrons stopping in, its proven difficult to get admission to the club but with Bachelor Party Bay, we'll make sure you have no problems skipping the line and heading into the club. The staff will take you to a private elevator where you will ascend to The Empire Hotel Rooftop Club. You can expect to see a friendly and energetic crowd here that is ready to party. The age range is usually wider early in the evening, but like most clubs it becomes more of a young crowd as it gets later. It is quite clear that the bouncers at the front door try to keep a good guy-to-girl ratio and keep a generally high overall attractiveness level. The Empire Hotel Rooftop Club attracts a relatively diverse crowd; mostly Caucasian with a mix of Latinas, African-Americans, and Caribbeans. There are lots of young professionals who come to mingle and network. The Empire Hotel Rooftop Club has an unbelievable layout that makes for an excellent VIP party. There is one main bar at the indoor room with some great looking bartenders mixing drinks. Blondes or Brunettes? Luckily you don't have to choose because there are an abundance of both behind the bar. These ladies are so beautiful, you will have to fight the urge to circle back for another drink before you finish the one you just bought. The two flatscreen TVs that sit behind the bar playing live sports are probably there so when a guy's girlfriend accuses him of staring, he can always say he was just drooling over the football game. To the left of the bar, the DJ booth is raised above a dance floor. The indoor area is where most of the dancing goes down. The DJs here are nothing short of amazing. You will never find the dance floor empty as the place vibrates with poppin' hip-hop beats, old school dance classics, and electronic mash-ups. This is definitely the place to unleash your best dance moves and get your bump-n-grind on. A doorway at the east end of the main room opens up to a large outdoor rooftop lounge. 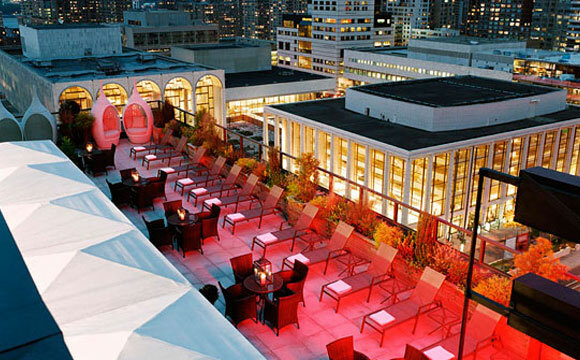 The Empire Hotel Rooftop Club hosts all kinds of special events here on the rooftop. There is a raised stage area in the middle of the rooftop floor where these events are usually held. From art displays to fashion shows, the rooftop always gives you something interesting to look at. The special events held at The Empire Hotel Rooftop Club magnify the sophisticated aura that the club exudes. You will also find dozens of couches and tables for relaxing and socializing. Most of the people who are there to mingle hang out on the rooftop because it gives guests a more intimate environment. The outdoor area is completely open so you are able to look out over the city lights from over fifteen stories high. There is another similar lounge at the west end of the club. This rooftop area is a bit smaller and is usually where they hold private events and large private parties. If this area is not reserved or the party has cleared out, the staff allows regular guests to enjoy the extra space. 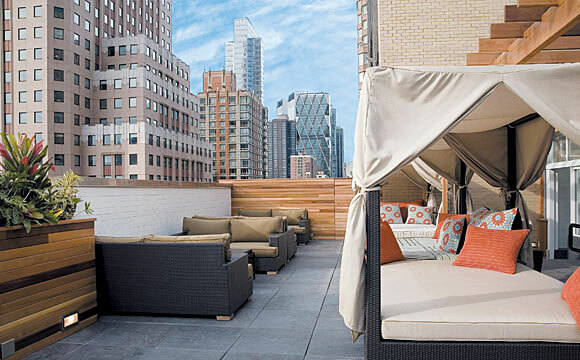 The west rooftop is more narrow and is lined with couches and tables. The area is partially covered to shield guests when the weather is not cooperating. At the end of the rooftop there is a fully operational bar. There is less open area to view the skyline but the west rooftop is always filled with people having a good time. VIP parties at The Empire Hotel Rooftop Club are always fun. With Bachelor Party Bay you can reserve a spot in any room of the club (the east rooftop, west rooftop, or inside) and their friendly staff will be more than happy to assist your every need. No matter how small or large your party size is, The Empire Hotel Rooftop Club will set you up with a comfortable space for you and all of your guests. As an added perk, VIP guests are given access to the club's food menu. The Empire Hotel Rooftop Club's kitchen produces some amazing appetizers and entrees to satisfy your appetite. Sliders, salads, and brick oven pizza are just a few of the refined dishes that the club's restaurant has to offer. The bottle service here is fantastic. An extensive bottle list gives you dozens of options from liquor bottles to champagne. Don't waste time standing in line, get your bottles and mixers brought straight to your table and mix the drinks yourself. Feel free to invite some of the beautiful ladies to join your party. The staff here at The Empire Hotel Rooftop Club understands that the girls are too pretty to let out of your sight. As long as you're having fun, they are okay with you getting to know as many girls as you want. If you like to drink, dance, and meet new people, then The Empire Hotel Rooftop Club is the place for you. Contact Bachelor Party Bay today and receive a free quote on a VIP party at The Empire Hotel Rooftop Club. Remember, when you book with Bachelor Party Bay, you receive discounted rates, quick entrance, and priority seating. Call or click today!